Moonlight and courage and sparks, oh my! That's what dragons are made of. Did you know that dragons don't just breathe fire...they sneeze it? Or that they love to barbecue--even their vegetables? 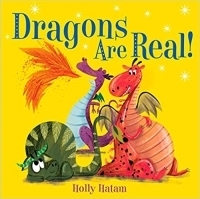 Fantasy lovers will be tickled to learn all sorts of "facts" about these Mythical Creatures in Holly Hatam's (#1 New York Times bestselling illustrator) unique new series. Look for Unicorns are Real, too!